As bucket list adventures go, this epic 18 day journey taking in the stunning Yellowstone National Park, the vast Canadian Rockies, and Alaska’s scenic Inside Passage is up there with the best. Experience the sleepless city of Seattle, including Pike Place Market on the waterfront, and get your cowboy fix with a drive through scenic Idaho and Montana. Enjoy two unforgettable nights in Yellowstone National Park, known for its impressive geysers, mud pools and abundant wildlife, and keep your eyes peeled for resident bears. Cross the border into Canada and discover the Icefields Parkway, Yoho and Mount Revelstoke National Parks, beautiful Banff, Lake Louise, and more. When it seems the trip can’t get any better, set sail on a dazzling seven-night Alaska Inside Passage cruise aboard either Celebrity Millennium or Royal Caribbean’s Radiance of the Seas ship, depending on your date chosen. Dock in Juneau, Skagway, and Ketchikan, plus witness the awe-inspiring scale of Hubbard Glacier. This incredible trip includes return flights, eight nights quality hotel accommodation, a seven night cruise, English-speaking tour guides, and so much more. 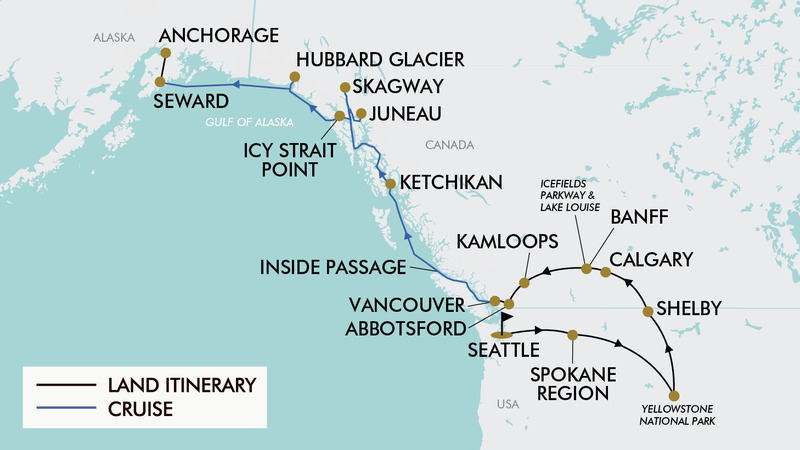 See the USA & Canada with a Rocky Mountaineer experience on our 18 Day Rockies & Beyond deal. Today depart from either Sydney, Brisbane, Melbourne, *Adelaide or *Perth to Seattle! Fly with either Delta Airlines, United Airlines or American Airlines (subject to availability). Upon arrival, make your own way to the hotel. Today visit Seattle’s famous Pike Place Market, which is one of the oldest continuously operated public farmers' markets in the United States. Afterwards continue on through the rolling wheat fields and wine country of Eastern Washington State. Pass by the Columbia Gorge, partially tracing the historic route of Lewis and Clark. Locals of this area boast about the dozens of lakes left behind by glaciers of the ice age. This evening arrive in the Coeur d’Alene/Spokane Valley region (approximately 5.5 hours from Seattle) where you will transfer to the hotel for an evening at leisure. Put on your boots, today you are travelling through the Cowboy Country of Idaho and Montana! This scenic drive is filled with American history; meandering rivers once brimming with gold and an abundance of wildlife attracting rugged mountain men, gold miners, and pioneers of the Frontier Days in American history. Sparsely inhabited, one can picture the American West as it was and remains today. Travel onward to Yellowstone, established as the world's first national park in 1872 (approximately 8 hours from Spokane Valley). You could spend a year in Yellowstone and still only scratch the surface of its wonders. Watch in awe as Old Faithful's waters arc nearly 100 feet (30 metres) into the air—as it has done approximately every 90 minutes since its discovery in 1870. Take a guided walk among the spouting geysers, bubbling mud pots and turquoise hot springs with a local specialist, and learn about the geothermal dynamics of this amazing wonderland. Enjoy a two-night stay in Gardiner, Montana in the Yellowstone National Park area. Each lodge has its own unique setting and atmosphere. Lodges featured are Absakora Lodge, Big Rock Inn, Rodeway Inn & Suites and Comfort Inn. Specific lodges will be confirmed in your travel documents. Today spend the day exploring Yellowstone on a guided tour and be swept away by the natural beauty and complexity of this stunning environment. View geological wonders such as the painted mud pots, geysers, prismatic pools, and the abundance of wildlife. The exact routing of today's touring and areas visited within Yellowstone are subject to favourable weather and/or road conditions and will be confirmed with travellers the day prior. Leave Yellowstone National Park and travel onwards across the plains of Montana towards the town of Shelby (approximately 6 hours distance) with a lunch stop along the way (lunch not included). Shelby, Montana, the county seat of Toole County, is located in north central Montana, approximately 50km south of the Canadian border and about 130kms east of Glacier National Park. Upon arrival in Shelby enjoy an evening at leisure. This morning cross the Canada-US border into Alberta, Canada and travel into the beautiful rocky mountains to the resort town of Banff. Along the way you will travel through Calgary, where you may enjoy a short sightseeing tour. Upon arrival into Banff transfer to your hotel and enjoy the remainder of your day at leisure. This morning drive into the famous Rocky Mountains along the famous Icefields Parkway (Highway 93) towards the Columbia Icefield Discovery Centre (approx. 2.5 hours each way). Considered the most beautiful drive in the world, the jaw-dropping scenery is punctuated by more than 100 ancient glaciers, waterfalls cascading from dramatic rock sprees and turquoise lakes set in sweeping valleys. Views of Crowfoot Glacier, Bow Summit, Mistaya Canyon are sure to please all who journey to this amazing part of the world. Upon arrival at the Columbia Icefield Discovery Centre take an opportunity to ride on the specially designed “Ice Explorer” (not included) which takes you onto the surface of the stunning Columbia Glacier. In the afternoon journey to Canmore. Along the way enjoy a stop and a walk along the shores of famous Lake Louise and soak in the tranquil beauty, history and geography of the area. Afterwards return to Banff and upon arrival at the hotel enjoy the remainder of the evening at leisure. This morning journey through three of Canada's most breathtaking National Parks: Mount Revelstoke, Glacier and Yoho. Continue onwards to the town of Abbotsford outside of Vancouver where you will check into the hotel and enjoy the remainder of the evening at leisure. Please note this day will involve approximately 10 hours of travel, including rest stops along the way. Fortunately, you will be blessed with amazing sights along the way, including huge snow-capped mountains and beautiful tree-lined lakes. After breakfast head to Vancouver for an introductory city tour including Chinatown, Gastown and Stanley Park. Then transfer to Canada Place in Downtown Vancouver where you will embark your amazing Alaska cruise with Celebrity Cruise Lines aboard the ‘Millennium’ ship. The cruise departs at 4.30pm. You'll sail beyond the Inside Passage into the more protected Alaska Inside Passage. Home to diverse wildlife—orca, mountain goats, bald eagles, bears, puffins, sea otters and more—the complex labyrinth of fjords and bays are where whales and sea lions find refuge during the summer months. You'll never forget the sight of 40-ton whales hurling themselves into the air, almost completely escaping the water. If you're especially lucky, you could see them swimming together to create a bubble net, trapping and eating fish by the giant mouthful. You've never tasted salmon so fresh. Known as the 'Salmon Capital of the World', Ketchikan is also the ancestral home of the Tlingit people, who have carved the world's largest collection of totem poles. If you're up for an adventure, take a canoe and nature trail excursion (not included) through the rain forest or a wilderness exploration followed by a sumptuous crab feast you'll long remember. For thousands of years, the Tlingit Indians have called this place home. Located near the city of Hoonah, and home to a historic cannery, Icy Strait Point also offers travellers the chance to view wildlife like humpback whales, orcas, seals, eagles, and brown bears, or to explore monuments to the region's fishing heritage. Dock in Juneau, the remote capital of Alaska, where cultured sophistication meets the ruggedness of the Last Frontier. Here there is a chance to take a glacial dogsled adventure in Alaska's capital (not included). The great Klondike Gold Rush lives on in Skagway's charming downtown of restored 19th-century buildings and its historic railway. From the vintage train (not included), admire the mountains and see the 1898 trail that fortune seekers travelled on foot. The White Pass & Yukon Route Railroad runs vintage locomotives (not included) past the famously steep Chilkoot Trail and offers sweeping mountain views during its climb toward Canada. Enjoy incredible, picture-perfect views from just about anywhere on the ship as the dedicated onboard naturalist narrates the experience and keeps an eye out for the whales, harbour seals, and otters that hunt and play in the waters of Yakutat Bay. With its dramatic and massive 7-mile-wide face and ever-changing wall of ice, the Hubbard Glacier lives long in the memory of any visitor to Alaska. Upon arrival in the port of Seward, Alaska you will disembark the cruise and be met and transferred to Anchorage Airport (approx. 2.5 hours distance) for your return flight home to Australia. Please note: flights from Alaska to Australia will fly via Los Angeles or San Francisco and this journey can take up to 30 hours. Customers who wish to break up their journey on the way home may choose to stay behind in Los Angeles, San Francisco or Vancouver for an additional fee. Please see the Important Info for further information. This morning journey through three of Canada's most breathtaking National Parks: Mount Revelstoke, Glacier and Yoho. Continue onwards to the town of Abbotsford outside of Vancouver where you will check into the hotel and enjoy the remainder of the evening at leisure. Please note this day will involve approximately 10 hours of travel, including rest stops along the way. Fortunately, you will be blessed with amazing sights along the way, including huge snow-capped mountains and beautiful tree-lined lakes. Please note: flights from Alaska to Australia will fly via Los Angeles or San Francisco and this journey can take up to 30 hours. Customers who wish to break up their journey on the way home may choose to stay behind in Los Angeles, San Francisco or Vancouver for a fee. Please see the Important Info for further information. Travel offer is valid for travel on selected dates until the 20th August 2020. Please note: dates/months with a * incur a land high season surcharge of $350 per person. Delta Airlines, United Airlines or American Airlines plus any codeshare partners(subject to availability). - Black out dates apply for departures before the 22 April 2020 and between 26th June 2020 to 26th July 2020. - Black out dates apply for departures between 26th June 2020 to 26th July 2020 and from the 20th September 2020 onwards. $350 per person, subject to availability. - This fee does however include an internal flight from Anchorage to Los Angeles. If you wish to forfeit this flight please advise our friendly reservations team so we may secure your return flight back to Australia. Please note, by choosing to forfeit your connecting flight the cost does not change. - If you fail to notify TripADeal that you will not be taking the Anchorage to Los Angeles flight with this Stay Behind option, and do not show up for this flight, your entire return flight will be at risk of cancellation by the airline. $450 per person, subject to availability. - This fee does however include an internal flight from Anchorage to San Francisco. If you wish to forfeit this flight please advise our friendly reservations team so we may secure your return flight back to Australia. Please note, by choosing to forfeit your connecting flight the cost does not change. - If you fail to notify TripADeal that you will not be taking the Anchorage to San Francisco flight with this Stay Behind option, and do not show up for this flight, your entire return flight will be at risk of cancellation by the airline. - This fee does however include an internal flight from Anchorage to Vancouver. If you wish to forfeit this flight please advise our friendly reservations team so we may secure your return flight back to Australia. Please note, by choosing to forfeit your connecting flight the cost does not change. - If you fail to notify TripADeal that you will not be taking the Anchorage to Vancouver flight with this Stay Behind option, and do not show up for this flight, your entire return flight will be at risk of cancellation by the airline. Minimum group size 30, maximum group size 54 per vehicle. - Columbia Icefield “Ice Explorer” Ride: $95 CAD (approx. $100 AUD). - Visa fees and requirements (a ESTA Visa Waiver for the USA and an ETA for Canada are a strict requirement if travelling on an Australian passport). Recommended land: $10 USD per person/day in total for driver and guide. Cruise: Additional gratuities up to 18% are payable on additional items and services such as wines and spa treatments. - Airport transfer on day 1. July is the hottest month in Seattle with an average temperature of 18°C and the coldest is January at 5°C with the most daily sunshine hours at 10 in July. The climate in Banff is cold and temperate due to its elevation (1400m). There is significant rainfall throughout the year in Banff, even the driest month still has a lot of rainfall. Summer temperatures are the warmest month and are pleasant with an average high of 21.6 °C and an average low of 7.3 °C. Snow has been recorded in all months of the year. Alaska’s Inside Passage region has a temperate summer climate. Dry in early summer, with slightly more rain likely from August onward, temperatures average between 4 °C and 20 °C. The weather is changeable. Expect long days of sunlight. Gratuities (tips) are not included in the tour price for services of the tour leader (when available) and driver throughout the tour. The recommended tip for the tour leader and driver is $10 USD per person per day, which will be collected whilst on tour. Pre-paid gratuities onboard the cruise are included in the package price. Any optional extras purchased onboard the cruise will have up to an 18% gratuity added. - Due to recent changes in the USA Immigration policies, TripADeal recommend all travellers visit US Customs & Border Protection. - Passengers who are not Australian citizens must check with the respective consulate or a visa agency to determine what their visa requirements are and what personal identification is required.